The Lunch Bunch program is an exciting extended day program that includes outdoor play, games, learning Spanish, and eating lunch. Participants are led by Miss Eileen (Piwowar) with no more than 10 children at any time. This allows every student to feel loved and valued. Lunch Bunch provides a flexible and convenient option for parents while also including a time of fun, physical activity and additional social time for participants. The program is available from 11:45a.m. to 2:30 p.m. on Tuesday, Wednesday, and Thursday of each week, beginning September 19th. 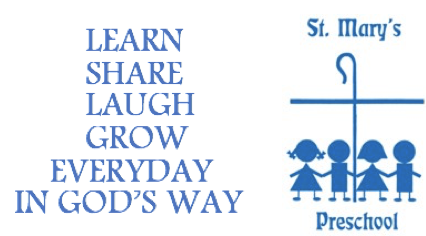 St. Mary’s Preschool students are welcome to attend Lunch Bunch on any of the three days, not just on the day when the child attends the morning program. Children may attend on a regular basis (specific day/days each week) or a drop-in basis (as needed). The students will bring a lunch from home which is ready to eat without refrigeration or heating as mandated by state regulations. See our website for options of what to include in the lunch with milk or water only, please. Our school is a “peanut-free” program; no nuts or nut products are allowed at Lunch Bunch. If your child’s lunch contains an item that needs a spoon or fork please include only metal utensils for your child to use. Virginia state law requires that each child’s lunch be labeled with his/her name and the current date. We will provide a lunch key tag put on your child’s lunchbox. Reservations will be taken on a daily, weekly or monthly basis so you can schedule Lunch Bunch as needed. Pre-registration is highly recommended so we can plan sufficient staffing needs; however, same day visits are welcome if space permits and we have a minimum of 3 participants per session. This is a great opportunity for students to enjoy an extended day in a mildly structured and stress-free setting. ** New students to Lunch bunch: we recommend you try out the program for a 1 hour visit the first time joining Lunch Bunch as we want to ensure that this is a positive experience and not too overwhelming. Keep it simple Think outside the traditional lunch box by offering several small (and healthy) choices that kids can use to create a whole meal. “Kids love to get hands on and assemble their own meals,” says Hirsch. “That’s one reason [packaged lunch kits] are so popular. Save money and make a healthier choice — make your own.” Consider packing three to four complementary ingredients, and then letting your child put them all together at lunchtime: a slice or two of whole wheat bread or a handful of crackers; chunks of cheese and sliced meats; grapes and cherry tomatoes; hummus with pita wedges or carrot and cucumber sticks; and apple slices (tossed in lime juice to retain color). A scoop of sunflower butter and whole-grain pita pockets are another no fuss option, as are lettuce wraps (baby gem or romaine lettuce leaves filled with cottage cheese or guacamole). Stick with what they know (and like) School lunch is not the time to introduce fried squid or wasabi roasted kale if your child has never tasted those particular delicacies. Your lunchtime goal is straight and simple: you want your child to get the nutrients he needs to do well in school. Save the green bean battles for dinner. Your child’s lunch should include protein for that busy brain, complex carbohydrates for energy, and fruit and vegetables for vitamins, minerals, and fiber. But don’t jam your child’s lunch box with healthy stuff she’s unlikely to eat. It’s better to work with your child to find foods that are both appealing and healthy. This means taking your kid shopping and talking about food and nutrition. Compartmentalize There’s something about meals served in their own compartments that even older kids love, which is why bento box-style lunch boxes with multiple small sections are such a hit with the school-age set. It also makes it easier to feel okay about slipping in a treat. If you fill one compartment with a cookie, you know to focus the rest on healthier choices.” Compartments can also boost a food’s appeal. Few kids will eat a limp salad, for example, but keeping the dressing in a separate container can solve the problem. Looks matter When it comes to food, looks matter — a lot. Many kids (and adults, too) refuse food that doesn’t look appetizing. This doesn’t mean you have to fashion food into fancy shapes. Instead, do what professional chefs do: serve foods in small portions that won’t overwhelm the appetite (another reason to invest in a lunch box with compartments). A fruit kebab is more enticing than a whole apple. Mini bagels, too, are more appealing than the adult size options. Reuse and recycle Leftovers get a bad rap, but last night’s dinner can be transformed into something original and tasty for the next day’s lunch. Rice, beans, and roast chicken can show up in your child’s lunch box later in the week, transformed into rice balls, bean burritos, and chicken wraps. Chicken pieces can form the basis of a salad, and extra pasta can be tossed with olive oil for cold pasta salad. Even better, none of these ideas require any additional cooking. Make it fun The same three things day after day get old, even for the fussiest eater, so surprise your child by giving lunch a touch of creativity. Pack breakfast for lunch with separate containers of granola, yogurt, and berries that your kid can mix together at lunchtime. Or skip the sandwich bread and substitute a whole wheat tortilla for a twist. At Hirsch’s house, mango chutney and cream cheese sandwiches are a hit, as is jelly served on leftover whole wheat pancakes instead of bread. Then there’s the infamous spaghetti taco, which suggests no end of taco variations guaranteed to amuse — and hopefully tempt — your child. Get your child involved Be sure to bring your child on board at every step of the lunch-making process: planning, prepping, and packing. Hirsch indulged his son’s request for a sunflower butter and pretzel sandwich, which he made with whole-wheat bread and multi-grain pretzels. “It turned out to be a winner,” he says. “He didn’t care that I used healthy ingredients because it was his idea.” If kids feel like you listen to their ideas, they are more likely to eat it. Include a dipping sauce if your kiddo likes dipping (and doesn’t just dump said sauce right out…), some fruit, a simple dessert, and/or some cubed meat or beans. Either using store-bought or homemade pesto (you can skip the nuts if need be and the flavor will be almost the same), toss into a pasta salad with halved cherry tomatoes, diced cheese or chicken, and thawed peas. Pair with fruit. These are good at room temperature or heated (and they work well to make-ahead). Include whole grain crackers or pita bread, some fruit, and perhaps some beans or simple veggies. Pair with yogurt or a cheese stick, a piece of fruit, and maybe a little cubed chicken, turkey, or ham. Spread Sunbutter onto a soft flour or whole grain tortilla and top with a banana or whole-fruit jam. Roll up and slice. Or, spread on cream cheese, add sliced turkey, and serve as a wrap for a simple main course. The next time you have pancakes on the weekend, double the batch and place leftovers in the fridge or freezer. Spread nut butter (use Sunbutter if lunch needs to be allergy-free) or cream cheese and jam or honey between for a simple, but unexpected sandwich. Pair these flavorful beans with whole grain crackers, diced veggies, cheese, and a piece of fruit. Or place over leftover brown rice and roasted veggies. Cut cheese and meat slices into small, bite-size shapes and stack with a thin smear of mayo, mustard, or hummus between. Serve with whole grain pita bread, toast, or crackers, and a favorite fruit. Spread herbed goat cheese onto soft tortillas. Top with minced spinach, thinly sliced cucumber, mashed roasted sweet potato, or shredded carrot. Slice into wedges for a quesadilla that’s great cold or at room temperature.